LESSON 2: Rural or Urban? LESSON 4: Unlock that Map! LESSON 5: Where Am I? Students will be able to sort common objects into categories to gain a sense of the concepts the categories represent. Finding and sorting images from magazines helps students define urban and rural. When all of the students are seated on their dot in the rug area I open up the screen on the SMARTBoard. On the SMARTBoard I have already loaded the PebbleGo website. This website has many resources on numerous topics but it is a paid subscription site. Our school subscribes to the site so we have access to many research opportunities for our students. The site can be used either to introduce students to a topic, which is what I am doing today, or used to support instruction. Occasionally I have a student who is bold enough to give it a go, but more often than not I do not have any students raise their hand. I will select a student who is following the correct protocol of raising their hand to answer the question. I use the PebbleGo website to give my students an introduction into what a rural area is. We live in a suburban area surrounded by shrinking rural areas. We have to drive an hour to get to a big city – Washington D.C. or Annapolis. My students are used to calling the surrounding area the country but I want them to understand a different terminology for out map unit. The interactive multimedia will help the students increase their vocabulary and give them insight into what they should be looking for in the magazines later on in the lesson. I select a student who is following the correct protocol of raising their hand to answer the question. I point to any student brave enough to try and respond. During reading I will go over new vocabulary words such as; exhausted, sooty, hustle and bustle, etc. We also review old vocabulary words such as; predator, prey, etc. We also discuss how the bright red jacket gives the city mouse away whereas the earthy tones of the country mouse’s jacket keeps him well hidden/camouflaged. I like to work with the vocabulary while we are reading because the words are heard in context which makes it much easier for the students to understand the word meanings. This aids in both vocabulary development and comprehension of the story itself. After reading we discuss how the author left the ending open because she had the owl and the cat talk about trading places which leads the reader to believe the story starts all over again with new characters. When we have finished having our discussion about the book itself I ask the students to recall the new word for country that we heard in our multimedia reader this morning. I call on a student to respond. I open a blank screen on the SMARTBoard and write the word Urban on one side and the word Rural on the other side. I draw a rectangle in the middle and label it both. I select as many students as I can without losing my students attention. After we have several items in each section I tell the students to take a seat around the edge of the rug. While the students are moving to take a seat, I get my supplies from a nearby location. I sit at the head of the rug and lay out my supplies. “Table number one go have some rural/urban sorting fun. Sorting is important as it is part of the classification process. When students are sorting they are classifying items based on a specific set of similarities. At first these skills are purely based on sight, sound, or texture. Later on these skills become more refined and groups can be broken into sub-groups. For example the animal group in an animal / non-animal sort can be broken down to mammalian and non-mammalian. Students need to practice classification skills as classifying saves people a lot of time. Think of a filing cabinet with hundreds of files. Information is easy to find when it is organized in a way that makes sense to the user. The office manager of a doctor’s office organizes the patient’s files alphabetically by their last name. Any file that is needed can be found almost instantly. But if hundreds of files were scattered and stacked without any order, it would be very hard to find a file you needed. Student sample of sorting. Middle performing student sorting. Middle performing student sorting 2. Higher performing student sorting. I use the fair sticks to select the order in which the students will go. Once the student has told me whether the image is rural or urban, they are free to go and use the hand sanitizer and go to get their snack. Wait until everyone is gone and we will come up with an answer together. This strategy gives me a quick insight as to whether the student understands the difference between the new vocabulary words they were just introduced to - rural and urban. Middle performing student sorting 2. For this activity I use a Rural Urban Sort Checklist. to go over the student’s work. The checklist serves two purposes. First, the checklist helps me stay focused on what I am looking for in the student’s work which shows me whether the student has met the objectives set for the assignment. If the student does not meet the objectives then I know I need to re-teach the lesson in a different way to the student during a small group session or one-on-one. Secondly the checklist helps convey information to the student’s family about how well their child is doing in the classroom. The student may also go over the checklist to see where they did well and see what areas they could improve on. Discussing student work for the rural and urban sort. At another station the students are sorting items/words into the correct sound circle. Their choices are /c/ like country or /c/ like city. The items to be sorted are things like celery, candy, corn, circle, etc. The student cuts out the items and glues the item into the correct circle on the recording sheet. 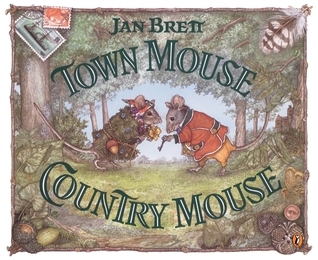 This recording sheet/activity is taken from the Teaching with Favorite Jan Brett Books. At another station the students select an inventory bag labeled with a letter. The students must write the letter of the bag they selected in their math journal and then dump the items out. Inside the inventory bag there is a mixed number of two city things. For example, Bag A might have four cars and three traffic lights. The student must sort the items, count the members of each group and then add the two amounts together to get a total number. The final thing the student must do is write a number sentence to represent what they did. For example, 4 + 3 = 7.